The original message - love one another. 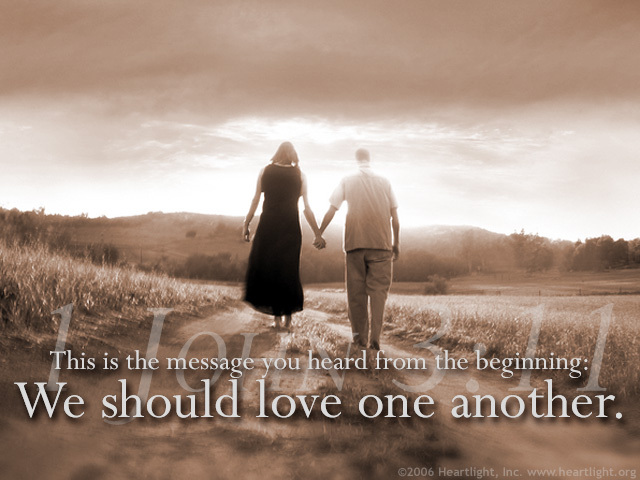 The enduring message - love one another. The most convicting message - love one another. The most difficult message - love one another. I'm reminded of the little verse: To dwell above with saints we love, O that will be glory. But to dwell below with saints we know, now that's another story. But it's the story we're called to write with our lives! This is God's enduring message he wants demonstrated in his children. Let's go out and live it! Loving Father, I commit to you that I will intentionally show my love for your children in what I do and say. I do this trusting your grace to empower me to do more than I would do on my own. Through Jesus my Savior I pray. Amen.